After a hiatus of a few years, Calluna Vineyards is back for #BD10 with two (2!) offers to rattle your chains and get you rolling into 2019 with some sick deals on our wines. I had to twist (owner/winemaker) David Jeffrey’s arm to agree to a discount this high PLUS FREE SHIPPING. There’s no going back now! Calluna’s #BD10 deals are only good for today (January 27). Get your order in ASAP to secure your bottles. Shipping will begin this week (weather permitting) unless otherwise requested. Stack both codes and steal both deals! As the flagship of the winery, the Calluna Estate is inspired by the defining wines of Bordeaux’s Left Bank featuring primarily Cabernet Sauvignon. Merlot and lesser amounts of Cabernet Franc, Petit Verdot and Malbec round out the blend. This wine is a selection of Calluna’s best lots from our estate vineyards. Each of the 12 blocks are fermented separately and then evaluated with blending trials after their first 5 months in barrel. The Calluna Vineyards Cuvée (CVC) is meant to be an expression of our Chalk Hill appellation where great sunlight and a cool climate produces intense fruit in a wine with balancing acidity, round tannins and moderate alcohol levels. The blend expresses the power of Cabernet Sauvignon, elegance of Merlot and Cabernet Franc, and a bit of showiness from Malbec and Petit Verdot. 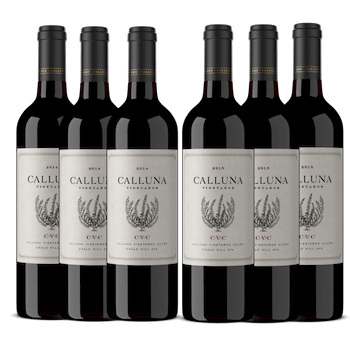 Calluna Vineyards took root in Sonoma County in 2005 with 12-acres in the Chalk Hill appellation planted to the traditional Bordeaux grape varieties: Cabernet Sauvignon, Cabernet Franc, Merlot, Petit Verdot and Malbec. From its advantageous hillsides overlooking the Russian River Valley, Chalk Hill is known for its mild climate and soils of clay underlain with fractured shale and sandstone. Five more acres were added in 2014, including Sauvignon Blanc and Semillon for Calluna Estate Blanc. After 20 years of studying and collecting the wines of Bordeaux and California, David moved to California and enrolled in Fresno State’s Enology program in 2001. Determined to make his dream a reality, David spent 3 ½ years studying winemaking and grape growing as he completed his degree and worked at Chateau Quinault in Bordeaux, France. Come visit us in Sonoma County. Molly (pictured below) would love to give you a personal "thank you" for your support! Off with a bang!! Thank you Paul! Thank you Tom! Looking forward to seeing you soon. These are phenomenal wines! As bordelaise as California gets. And big shout out to Mr. Cooper and Mr. Stoneking on the awesome orders, thank you!! Thank you, David!! High praise coming from you. More restrained style here, Brian. David Jeffrey worked with Alain Raynaud at Chateau Quinault in St Emilion and prefers lower brix harvesting, natural acidity, no manipulation in the cellar. Everything Calluna produces is 100% grown on the property up on Chalk Hill overlooking the Russian River Valley. Low-trellised vines, harvested once the grapes lose their green flavors. David wants to keep that gorgeous structure in the wines and highlight the Sonoma fruit intensity we get but with a touch of savory edge. Old school style. Thank you for your orders Carlos and Robert!! Thank you, Brian!! You won't regret it. 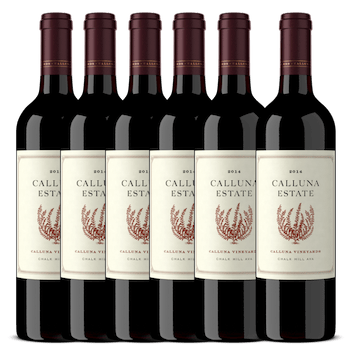 This 3-vintage vertical of Calluna Estate is the real deal. 3 fabulous vintages. Order confirmed! Thank you! Pro-tip! If you want to purchase both #BD10 offers, you can do it all within 1 shopping cart. Add both promo codes to your cart to get the discount on both. Stack them codes! Thank you Jim (and David) for this offer! Each year I make sure to try one new winery - never have I ordered a case - well had to pick up one of each 6 pack! Sorry I missed the pro tip and processed two orders. Thank you, Bill!!! I have your orders confirmed. Thank you Mr. Stotter and Mr. Lipkin, love seeing Calluna heading to new customers! No worries! I can easily combine your orders on the back-end. The 2013 and 2014 both are surprisingly expressive for their youthful states. I like an hour decant on them (more if you have time) to really let them open. The 2012 was a slightly more tannic year. But there's stuffing and weight in the wine to counter balance. So I would probably decant the 2012 longer (or hold) and dig into 2013 first. I personally think 2014 was a stellar year for Calluna and that vintage of Calluna Estate is a magical wine. Cheers! Just for clarification, are you charging sales tax for orders delivered outside of California? Like to NJ? Thank you, Rob! Looking forward to hearing your thoughts on the wines. Cheers! We only charge sales tax for out-of-CA orders where we are required to by our DTC licensing. For example, NY and PA force us to charge sales tax in order to sell wine to residents of those states and legally ship there. But for NJ there is no sales tax. Let me know if something doesn't look right to you. Thanks! Thank you Mr. Feldman! Love it when our Wine Club members double-down and stock up on the goods. Warms our hearts! Thank you for your order, Steve! Got your note about being out-of-town... we'll coordinate shipping so we catch you and Debra in town. Cheers! Not a problem at all, Brian! You don't need to join our wine club to get offered future allocations of our wines. However, Wine Club members get first dibs on our very limited wines like our Merlot "Aux Raynauds", Colonel's Vineyard Cabernet, and Malbec. And of course our Wine Club members get preferred pricing all year long. With your #BD10 purchase today, you'll be on our mailing list moving forward and we'll keep you informed on new releases, events, etc... Cheers! Thank you, Mr. Turk, Mr. Beckett, and Mr. Wayne! Thank you for your orders, Benjamin and Rajiv! We can definitely delay your shipments until the weather gets better. Easy! Consider it done. Cheers! They keep on rolling, thank you so much for your orders Mark, Mary, Kirby, Larry, John, and Rich! Awesome afternoon shaping up over here. Y'all are keeping me busy! Big thanks to Nathan, Jimmy, Keith, Zachary, Michael, and Thomas!! Love seeing the diversity in the orders coming through. Thank you all for your support! Visited Mr. Jeffrey several years ago. Loved CVC. Order in! Last edited by Richard Jen on February 1st, 2019, 9:03 am, edited 1 time in total. Thank you, Michael!! Order confirmed. Visited Jeffery several years ago. Loved CVC. Order in! Thank you, Richard!! Your order is confirmed. Thank you, Carlton! Order confirmed, and we can delay that shipment for better weather for sure. The 2011 Estate is drinking beautifully. It's not as dense as the 2012/2013/2014 due to the cooler qualities of the vintage, but it's holding its own, for sure. Still showing its youthful energy and good tannin structure. Makes for a fantastic visit and tasting experience, too.